Designer kurtis have become the latest craze among women all over the world and designers are trying their best to design kurtis in vibrant prints and colours to make them more attractive so they can fulfil the ever-increasing demand for designer kurtis in the market. 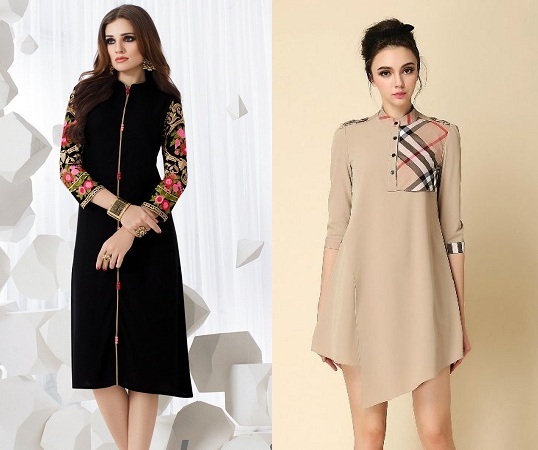 These kurtis have even made a mark in the international market where not only Indians but people from other countries have also started liking them. Loaded with fashionable designs, embellishments, and embroidery, designer kurtis have caught the fancy of all ladies regardless of the culture or class they belong to. Created with exotic patterns and styles, these kurtis are designed to meet the requirements of any occasion. Be it a small party or a wedding ceremony, women find them suitable for all events. Kurtis without embroidery with simple designs are also available for those who wish to look simple and yet sophisticated. Designer kurtis in the casual wear category are embellished with small cut-glass pieces, laces, beads, small borders, or pearls. These kurtis are usually paired with some elegant artificial jewellery which makes them look all the more charming and exclusive. Nowadays, kurtis with an Indo-Western look are started appealing masses throughout the world. Manufacturers and designers are not leaving any stone unturned in the fashion world to meet the requirements of their customers round the globe. Be it a tunic of Bollywood style to be worn with jeans or an Indian tunic with intricate embroidery to be paired with ‘A’ shaped pant, there is an unlimited variety of designs, colours, and patterns of designer Indo-Western kurtis to choose from. A range of fabrics such as crepe, cotton, georgette etc. 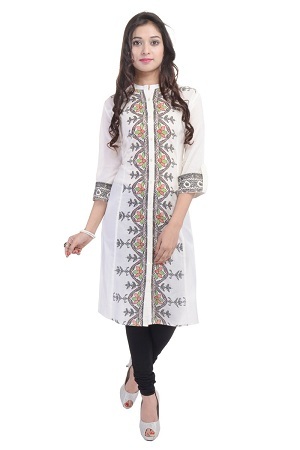 are also used in some of these kurtis keeping the price factor and growing demand in mind. 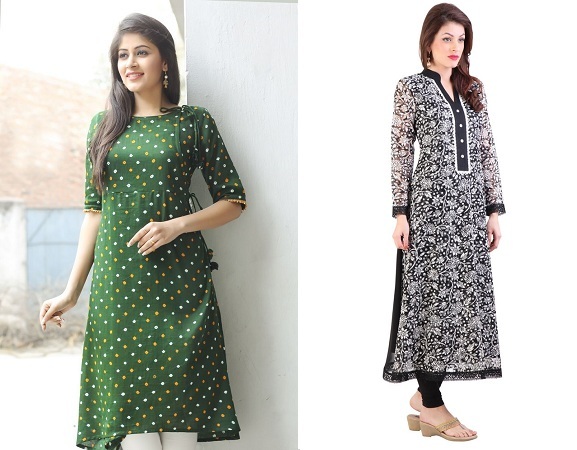 Designer kurtis today are available in both lengths – long and short. With leggings, people usually prefer longer kurtis while short kurtis go well with skirts and jeans. Designer kurtis with bandhani prints, angrakha style or chikan work are the first preference for routine wear while those with zari work and embedded with pearlsor wide borders at the sleeves are generally chosen for parties or small gatherings. Recently, there is a growing fondness for kurtis designed with criss-cross neck-lines ora Chinese collar with delicate piping around the collar. 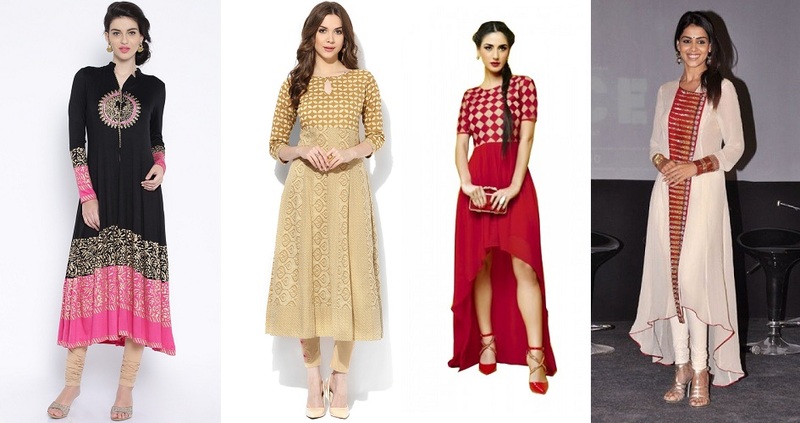 With the growing inclination of fashion industry towards anarkali suits, designers have started offering similar patterns and styles in kurtis as well. These kurtis remind you of the Moghul era when craftsmanship of dresses was completely different and looked highly exotic. 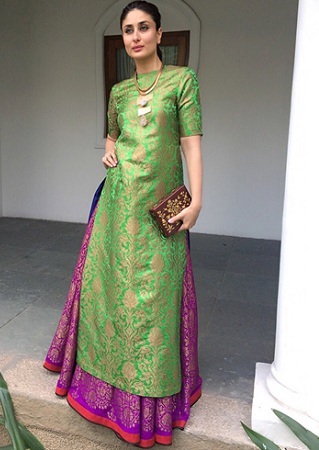 Traditionally, these kurtis were worn by the female members of royal families but today, they are extremely popular among those who simply prefer flaunting a luxurious look in social gatherings. 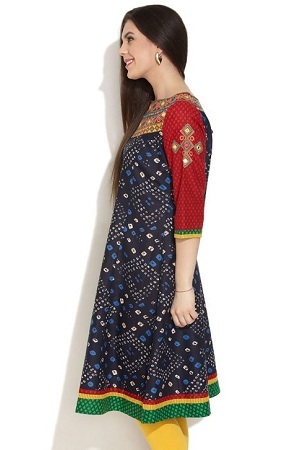 These kurtis not only add dignity and grace to the attire but also exude elegance to the wearer. Previously, these kurtis were made only with silk, brocade, or cotton but now, designers use a line of fabrics such as net, chiffon, and georgette to make these kurtis affordable for the common masses.